extends from Great Lakes Superior and Huron in the south to James Bay in the north, from the Quebec border in the east to the Manitoba border in the west. Satellite photo of a portion of Northern Ontario. 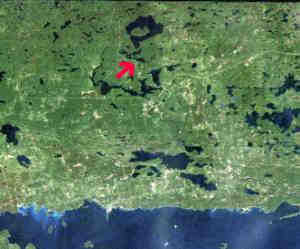 The arrow indicates the location of Kegos Camp.The large body of water at the bottom of the photo is Lake Huron, third largest lake in the Great Lakes system.